Wholly owned subsidiaries of Altria Group, Inc. (NYSE: MO) include Philip Morris USA Inc. (PM USA), U.S. Smokeless Tobacco Company LLC (USSTC), John Middleton Co. (Middleton), Sherman Group Holdings, LLC and its subsidiaries (Nat Sherman), Nu Mark LLC (Nu Mark), Ste. Michelle Wine Estates Ltd. (Ste. Michelle) and Philip Morris Capital Corporation (PMCC). Altria holds an equity investment in Anheuser-Busch InBev SA/NV (AB InBev). In the recent past, Altria’s has shown increasing interest in the cannabis sector. In fact, Tobacco sales haven’t improved much in the past few years, and therefore cannabis has become a natural extension for the tobacco industry. In fact, both the alcohol and tobacco industries are considering cannabis as a promising catalyst which could offset the weaker sales, price competition in cigarettes and alcohol beverages. Furthermore, this could also be seen as Altria, hedging/diversifying its portfolio against the transition of consumer interest/preferences to cannabis products. In other words, the company is expanding along with buying insurance for its market risk profile. Moreover, these investments positions Altria to participate in the emerging global cannabis sector, which it believes is poised for rapid growth over the next decade. Furthermore, it also creates a new growth opportunity in an adjacent category that is complementary to Altria’s core tobacco businesses. On 20th DecemberAltria and JUUL sign service agreements to accelerate JUUL’s success switching adult smokers; JUUL has the unique opportunity to reach adult smokers through prime retail shelf space, inserts in cigarette packs and adult smoker database. JUUL will remain fully independent post this investment. Provides significant stake in the largest and fastest growing e-vapor company with a highly-talented management team, successful in-market products, and a strong innovation pipeline. JUUL will remain independent and retain complete operational autonomy to capitalize on its entrepreneurial success. Provides exposure to strong revenue and volume growth opportunity with attractive unit economics. Investment in the leading U.S. e-vapor company complements Altria’s non-combustible product portfolio. Exposure to significant international growth plans and global e-vapor profit pool. On December 7, 2018, the company announced that it has entered into an agreement to acquire newly issued shares in Cronos Group Inc. (Cronos Group) (TSX: CRON and NASDAQ: CRON), a leading global cannabinoid company, headquartered in Toronto, Canada. 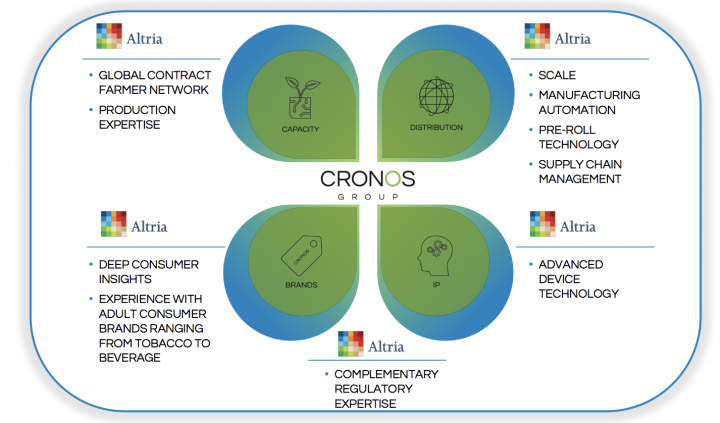 The transaction represents a 45% equity stake in Cronos Group, at a price of CAD $16.25 per share, for an aggregate investment by Altria of approximately USD $1.8 billion (approximately CAD $2.4 billion). Furthermore, due to the lower price levels, the stock is offering a solid 7.1% dividend yield for the first time in nearly a decade. The company has raised its dividend 53 times in the last 49 years. Upcoming Presentation: The company will host a live audio webcast on Thursday, January 31, 2019, at 9:00 a.m. Eastern Time to discuss its 2018 fourth-quarter and full-year business results. Altria will issue a press release containing its business results at approximately 7:00 a.m. Eastern Time the same day. Analyst ratings and target price: Per www.marketbeat.com, 14 Wall Street analysts have issued ratings and price targets for Altria Group in the last 12 months. Their average twelve-month price target is $65.1925, suggesting that the stock has a possible upside of 43.91%. The high price target for MO is $75.00, and the low-price target for MO is $55.00. There are currently two sell ratings, four hold ratings and 8 buy ratings for the stock, resulting in a consensus rating of “Hold. About the Company: Altria’s wholly-owned subsidiaries include Philip Morris USA Inc. (PM USA), U.S. Smokeless Tobacco Company LLC (USSTC), John Middleton Co. (Middleton), Sherman Group Holdings, LLC and its subsidiaries (Nat Sherman), Nu Mark LLC (Nu Mark), Ste. Michelle Wine Estates Ltd. (Ste. Michelle) and Philip Morris Capital Corporation (PMCC). Altria holds an equity investment in Anheuser-Busch InBev SA/NV (AB InBev). The brand portfolios of Altria’s tobacco operating companies include Marlboro®, Black & Mild®, Copenhagen®, Skoal®, VERVE®, MarkTen®, and Green Smoke®. Ste. Michelle produces and markets premium wines sold under various labels, including Chateau Ste. Michelle®, Columbia Crest®, 14 Hands® and Stag’s Leap Wine Cellars™, and it imports and markets Antinori®, Champagne Nicolas Feuillatte™, Torres®, and Villa Maria Estate™products in the United States. Net revenues increased 1.6% to $6.8 billion, primarily due to higher net revenues in the smokeable and smokeless products segments. Revenues net of excise taxes increased 3.3% to approximately $5.3 billion. Reported diluted EPS increased 6.2% to $1.03, primarily driven by lower income taxes and fewer shares outstanding, partially offset by the 2017 gain on the AB InBev/SABMiller business combination. Adjusted diluted EPS increased 20% to $1.08, primarily driven by lower income taxes and fewer shares outstanding. In August 2018, Altria’s Board of Directors (Board) increased the regular quarterly dividend by 14.3% to $0.80 per share. Altria’s current annualized dividend rate is $3.20 per share, representing an annualized dividend yield of 5.2% as of October 19, 2018. Altria paid over $1.3 billion in dividends in the third quarter. Altria expects to maintain a dividend payout ratio target of approximately 80% of adjusted diluted EPS. Future dividend payments remain subject to the discretion of the Board. Outlook: Altria tightens its guidance for 2018 full-year adjusted diluted EPS to be in a range of $3.95 to $4.03, representing a growth rate of 16.5% to 19% from an adjusted diluted EPS base of $3.39 in 2017 as shown in Schedule 10. This guidance range excludes the special items for the first nine months of 2018 shown in Table 1. Altria’s 2018 guidance reflects investments in focus areas for long-term growth, including innovative product development and launches, regulatory science, brand equity, retail fixtures, and future retail concepts.Altria expects its 2018 full-year adjusted effective tax rate will be in a range of approximately 23% to 24%. Company’s ability to maintain its liquidity and financial flexibility to fund its incremental capital requirements. In this sector, the regulatory framework and science are rapidly changing and evolving. Therefore, new companies are emerging, and regulatory risk always exists for the players in the industry. Unfavorable litigation outcomes could materially adversely affect the consolidated results of operations, cash flows or financial position of Altria or the businesses of one or more of its subsidiaries. Significant federal, state and local governmental actions, including actions by the FDA, and various private sector actions may continue to have an adverse impact on the company’ tobacco subsidiaries’ businesses and sales volumes. 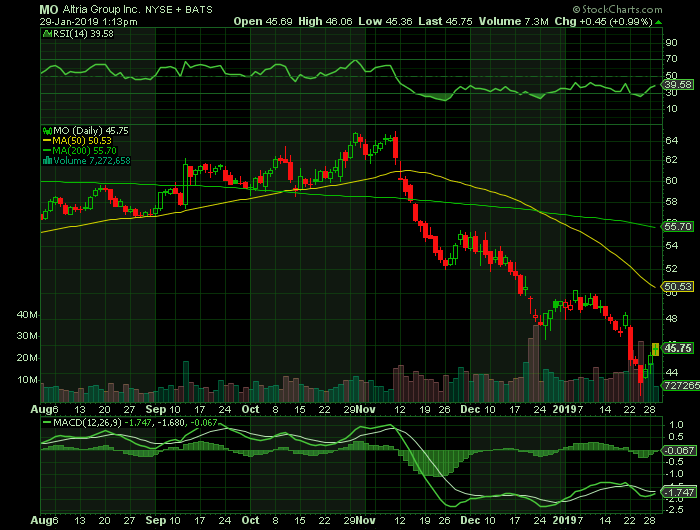 The present support and resistance levels for the stock are at $43.39 & $46.45 respectively. Newer PostBiocept, Inc. Biotech Roundup, Biocept Pipeline, Upcoming Catalysts, and Price Targets. Older PostHas OncoCyte Changed How We Will Diagnose Cancer in the Near Future?